East End institution with a chequered history. 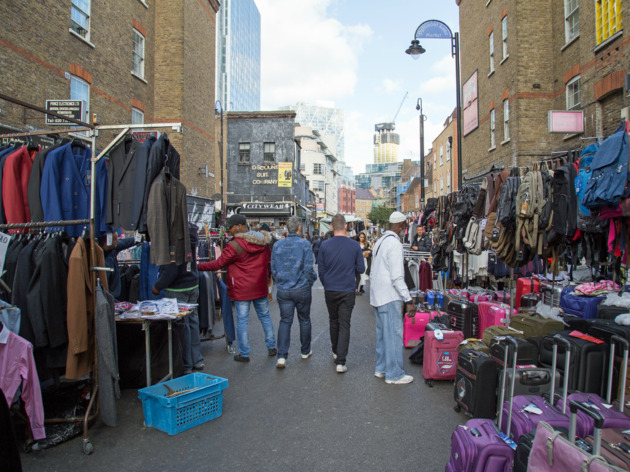 There’s a reason why Petticoat Lane Market is no longer on Petticoat Lane and that’s because Petticoat Lane no longer exists. Thanks to the prudish sensibilities of the Victorian era that found undergarments uncouth, the street was renamed Middlesex Street in 1846. Five stars for the food in the market; it's becoming bigger as well and more stalls pop up now. My favourites remain the classics (chicken katsu wrap for a reasonable £4.50, the chicken satay large for £5, or the always reliable falafel wrap now £3.50 instead of £3. Food is delicious, filling and relatively cheap considering. Beware of the pigeons though - especially at the South entrance of the food market! Great lunch time deals to be found here for anyone who works around the area. I try to go once a week. So many good stalls at Petticoat Lane market! My favourite is the falafel wrap for £3! It's called medium size but huge and will definitely make you full. The satay and katsu chicken wraps are also great. It's best to just get takeaway, but there are a few seats around if you can't wait to eat! I would definitely recommend for anyone who works nearby for a quick lunchtime feed, but it's also worth travelling to as the food is totally worth it, and so cheap! 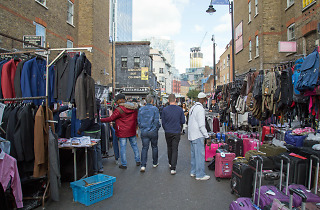 I would never recommend Petticoat Lane Market for its tat and branded clothes from unknown sources, but there’s one reason I’ve been coming back, at least once a week, for my lunch or takeaway dinner from I-Falafel. I don’t remember how I discovered the place, but since I found it, I introduced tens of people to the food. One visit and you become a loyal customer (even if you’re a meat eater!). They always have the biggest queue among the food stalls, sometimes even 30 people, but you’re being served with a blink of an eye, getting a little falafel treat while waiting. I’m sure many of you are now familiar with the place due to the recent viral video of the 13-second-falafel man. He’s not only the fastest, he’s the best! For £3 you get a medium size portion (that is big enough to kee you full for hours), for £4 you get a massive one. You can get it in a wrap or a salad box without bread. All the main ingredients (falafel balls and hoummus) are freshly made every morning. I saw it with my own eyes when they took me on a little VIP tour this week to show me a little production line in the nearby shop. It’s not only freshly fried but expertly combined with salad, tomato, rocket, harisa, tahini sause and pickles (at the beginning they used to also add fries to the combo, but I think the current healthier option is more appealing). You really need to see these guys in action. Hungry? Go straight to the food market and you won't be disappointed! The falafel wrap is so delicious and very very cheap. Medium size is huge and it costs only 3 pounds. There is a queue most of the days but it goes fast as the falafel guy is a talent giving a show making the wrap so fast accompanied with some loud Lebanese music. The katsu wrap is also amazing. Don't be discouraged by the long queue, they are also very fast! There are so many salad options to put inside the wrap that it almost compensates for the deep fried chicken katsu it has. The Satay chicken stall must be a new one attracting plenty of people as there is always a big queue! Medium one is enough (don't go for the curry but for the satay chicken - it is so delicious! I love it) but if you're too hungry and not scared about sleeping on your desk afterwards, you can try the large one and go for half and half. Indian is good, Chinese is decent. Some stalls have chairs where you can sit. Avoid Fridays if you can as it gets too busy! There is also a wide range of clothes in very low prices. This market definitely made my lunch breaks more interesting as my office is around the corner! It is worth it a visit even if you don't work nearby.